Evolution Home Theater is your go to source for High Fidelity, Home Theater and Home Automation Systems. 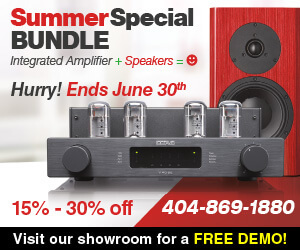 During our Summer Special you can save 15% off Dynaudio Speakers or Octave Audio Products and get 30% off when you bundle them together! Stop by our showroom to see and hear a wide assortment of exceptional products from both companies. We will be hosting a catered event in June with Dynaudio and Octave representatives on hand. Call or email us if you’d like an invitation. Space is limited so reserve your spot today!! Paradigm Demo Model specials, including Profile and Monitor series. B&W CM series specials. both demo and new. Please call 404-869-1880 for availability of specific models. Great deals. Anthem 225 Integrated Amp Demo - Regulary $2000.00 - sale $1500.00. McIntosh MAC6700 Reciever - Regularly $6500.00, Demo price discussed in-store only for McIntosh.